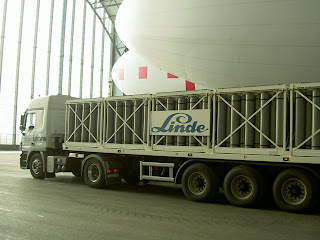 The Linde Helium trucks arrived early on the 15th. As we walked into the hangar we were greeted with this unearthly wooshing noise, the sound of helium under very high pressure going through the nozzle and expanding into the hull. The expansion is so rapid that a sonic effect is set up and it's quite loud! The filling took most of the day and then overnight the airship was on the helium purifier, getting rid of moisture, particulates and heavier atoms and molecules to leave the helium about 98% pure. She is now an airship that could fly and yesterday she went from having assembly insurance to proper hull insurance. The first of a number of big events done!